"Good Cookies!! You'll be giving out this recipe forever!!! Be sure to leave the cookies on the cookie sheet for at least one minute after removing them from the oven. This allows them to "flatten" and firm up, also make sure you use rolled oats, not instant! Please don't let all the ingredients scare you away from this recipe." In a large bowl, cream together the butter, white sugar and brown sugar until smooth. Beat in the eggs, one at a time then stir in the vanilla. In a separate bowl, combine the oats, wheat germ, flour, baking powder, baking soda and salt. Stir the dry ingredients into the creamed mixture. Finally, mix in the coconut, pecans and dates. Drop by rounded spoonfuls onto ungreased cookie sheets. Bake for 8 to 10 minutes in the preheated oven. Allow cookies to cool on baking sheet for a couple minutes before removing to a wire rack to cool completely. The wheat germ is subtle. I added chocolate chips. I made them twice within a couple of weeks to use up wheat germ that was about to expire. 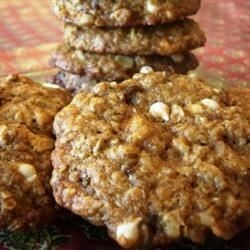 A nice chewy/crunchy oatmeal cookie with a twist.